I love entertaining on my porch! Come on over and grab a seat! I want to welcome everyone coming from Taryn Whiteaker. The weather has been warming up, but with a breeze, the evenings have been quite nice. 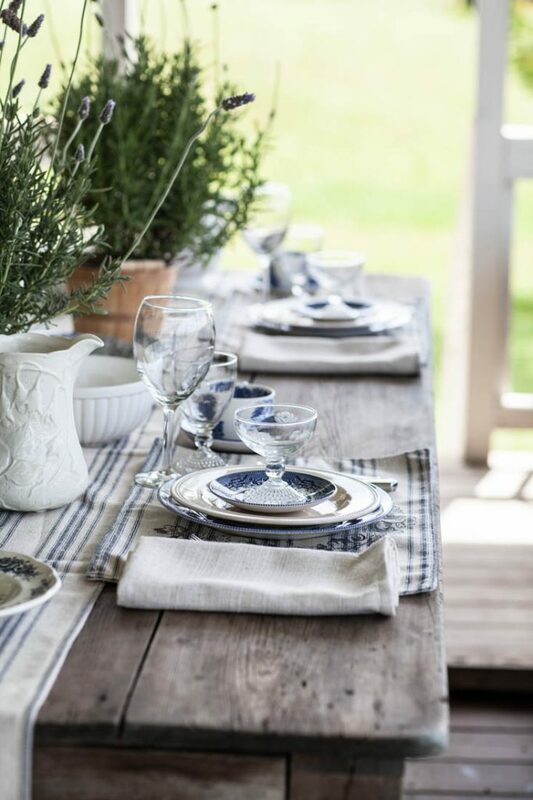 I love setting this table for friends as we watch the sun set and enjoy the breezes. Blue and white is the perfect choice for me. 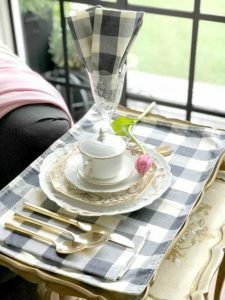 If you like any of these placemats, the table runner and the napkins, they’ll be available for sale in our DECORATING TIPS AND TRICKS SHOP very soon! To see today’s sale items, including that gorgeous buffalo check placemat below, CLICK HERE. 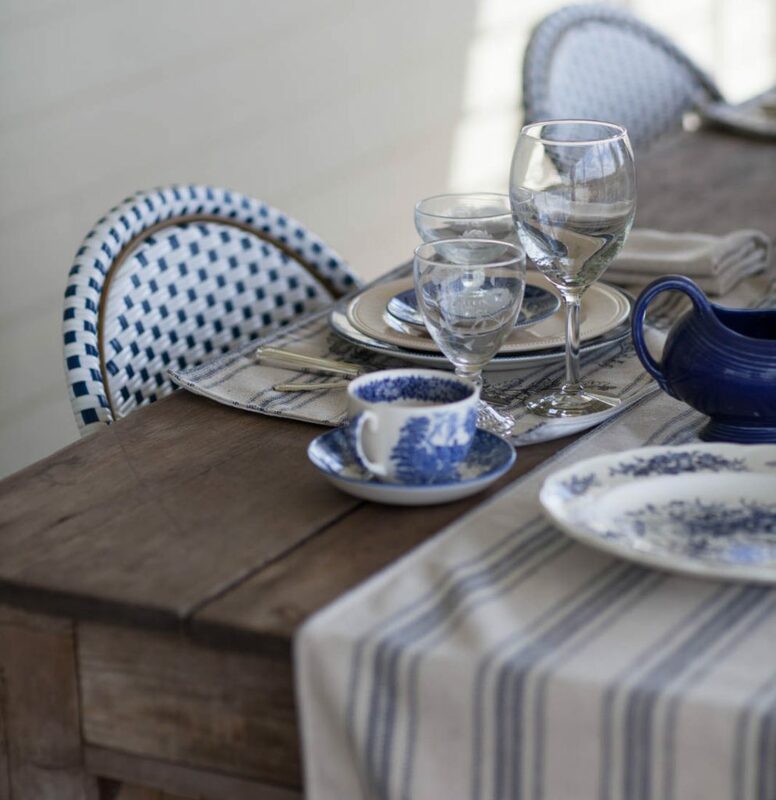 I even have blue and white chairs for my porch. I like to set up a table with drinks so guests can serve themselves. And although we have a table inside, this is my preferred spot to entertain. We (and the neighbor) recently had a new fence built, which means they’ve torn down the old fence. Along the old fence were a lot of small trees and shrubs they had to remove when they took the old fence out. As a result of that work, we can now see the neighbor’s pond, which I very much enjoy. Here ponds are called tanks. There’s speculation that they are called tanks because the German word for pond is teich which sounds a lot like ‘tank’. This area was settled by German immigrants, so there’s that theory. The other theory is that it is called a tank since the stock or cattle drink from it, so it’s considered a ‘stock tank’. Either way, it’s a great way to tell if someone is from the area, or just visiting. If they say ‘pond’ I know they aren’t from here. A little lavender on the table reminds me of my beloved France. No I’m not from France, but I do have ancestors that were from there. My French is terrible; basically I just know how to order food in France, which really is the important stuff if you ask me. Our DECORATING TIPS AND TRICKS podcast episode today is all about dining room tables and how to choose the right one for you. You can usually hear the birds all day, sometimes I hear a cow or two, and in the evening the frogs start singing. At least that’s what we think we hear. I love leaving the windows open, but we’re past that point until probably December. It’s just too hot most of the year. Now be sure to visit my buddy Kelly and check out her amazing home. CLICK HERE to visit MY SOULFUL HOME. I really love my porch. But I’d love to move it to your farm! Such a beautiful table! Wish I was your neighbor! So inviting, truly shows the pride and love you have for your home, family and friends. Laura, I wish you were too!! Those dishes you used are divine! Your porch looks like a nice lovely place to sit back and relax! Love the rustic (candle?) chandelier, Where did you purchase such a lovely piece? Love it all, so relaxing and fun to have friends over. It was an electric chandelier and I converted it to use for candles. Thanks for the post loved it. I too am wondering where you purchased your chandelier I love it. I see where you said you converted it from electric and would love to purchase one myself. 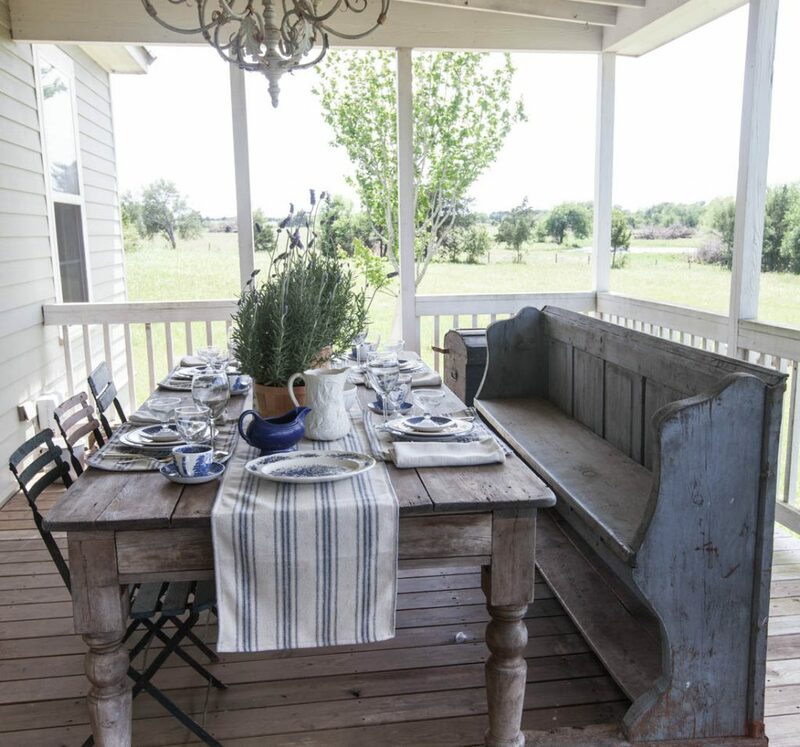 The porch and sprin/summer time are the perfect match! 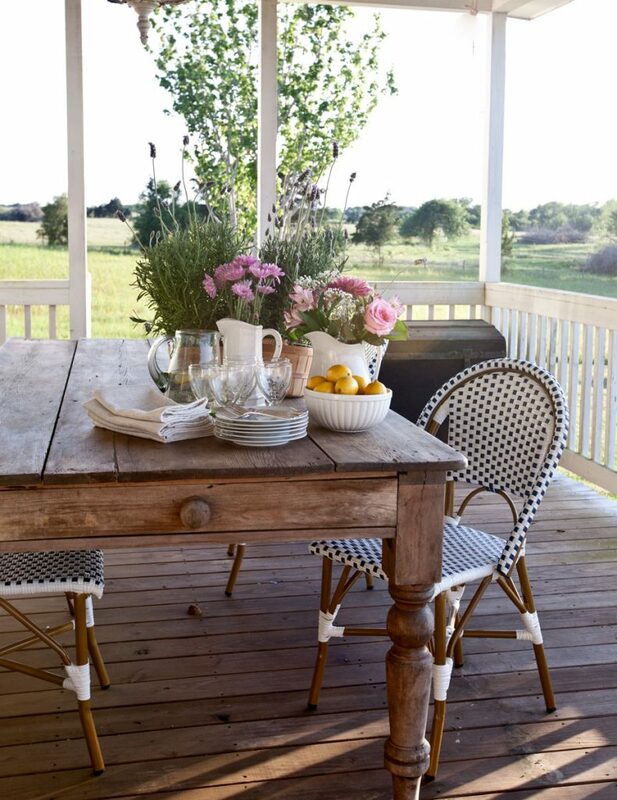 Your porch is a ture inspiration! 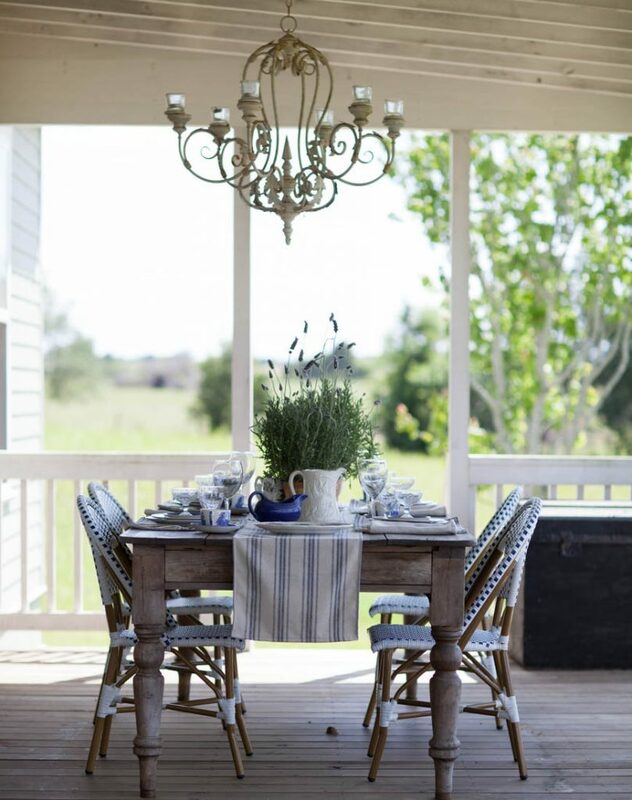 Beautiful porch and table setting. The checked chairs are just marvelous!! And how interesting that ponds are called tanks! Ha!